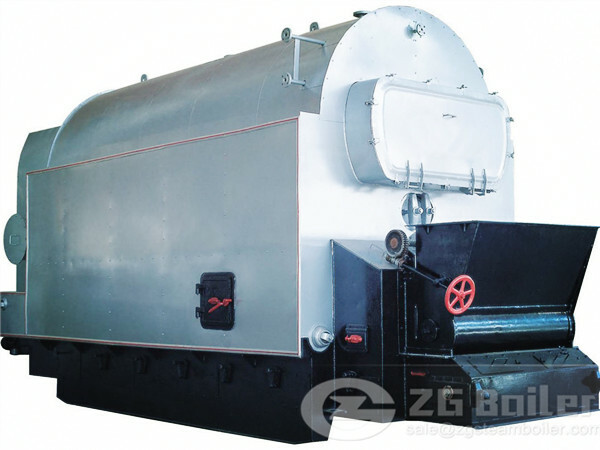 ZG SZL type boiler is a kind of double drum longitudinal chain grate stoker water tube steam boiler of coal fired. this product can supports the implementation of stratified combustion devices and other energy-saving equipment according to user requirements. It double drum design, single layout, compact structure, large heating area, boiler heating surface more than similar products by 10%. Compare with other coal fired boiler, ZG coal fired chain grate stoker boiler has some advantages. 1.The boiler has high thermal transfer efficiency at convection heating area, reasonable water cycle system, large water capacity & steam space and high steam quality. 2.The boiler has stable operating efficiency and overload operating ability. Light chain belt type assembly grate is matched with stepless speed regulation device, making the adjustment method of the best combustion mode to be more complete. 3.The boiler is equipped with light chain grate to achieve mechanical feed coal, with air blower and induced draft fan to achieve mechanical ventilation, and with screw slag machine to achieve automatic slag discharge.Fuel, after falling onto furnace grate from coal scuttle, is fed in furnace tank along with furnace grate. 4.The boiler owns high automation level-automatic water supply adjustment, automatic high and low water level alarm, lowwater levelinterlock protection, fan&blower interlock protection, automatic coal feeding, automatic slag discharge. All of the above, they are the advantages of coal fired chain grate stoker boiler.